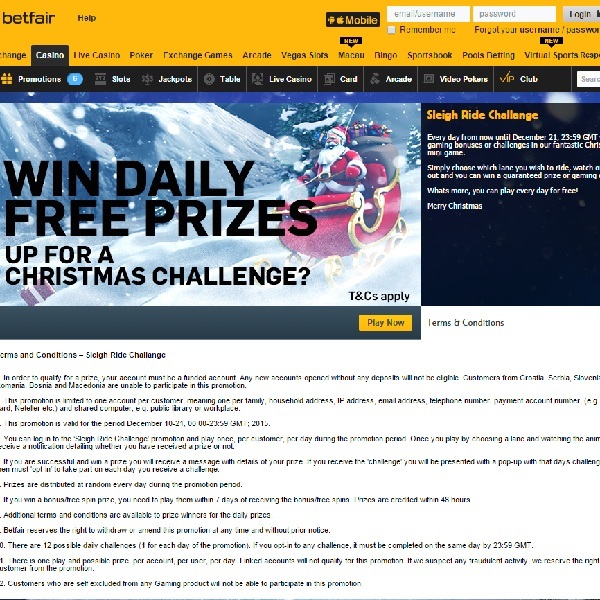 Every day from now until December 21st Betfair Casino is giving members the chance to win a free prize or take part in a challenge for guaranteed rewards. All you have to do is play the casino‘s Christmas sleigh ride mini game. You pick a lane to ride in and watch the Santas battle it out and you will win a guaranteed prize or gaming challenge. The game is free to play and it is possible to play it every single day. The prizes on offer include everything from free spins to bonuses and cash back. The challenges require you to opt in and complete them in order to receive your prize. Make sure that you have a Christmas to remember, head over to Betfair Casino every day and play the Sleigh Ride game to start winning prizes straight away.